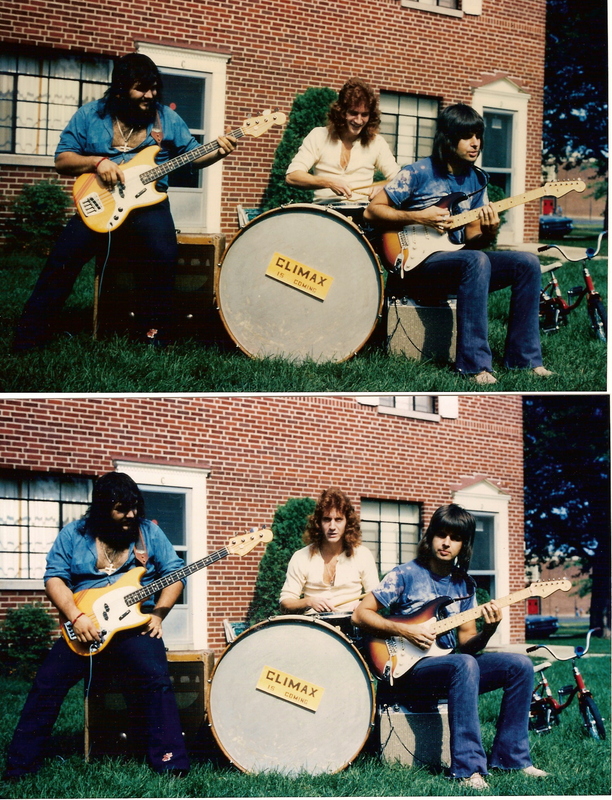 Climax was started by Bob Hill and Mike Haines on the heels of the original Strongbow. 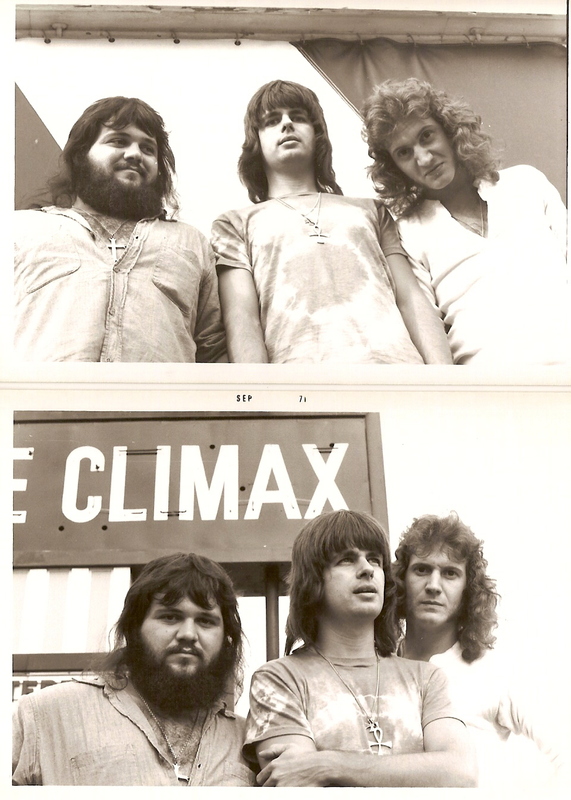 Bob Hill recalls - "Climax was probably my peak of performing energy and enthusiasm. In this group we explored the areas of stage movement, lighting, extended jamming, volume, clothes, writing and any other components of performing we could think of. I had gone on a vacation and had seen the new movie, "Gimme Shelter". In it, the Rolling Stones performed a loose. sloppy version of "Under My Thumb" - which I adored! As the guitars, piano and bass eased into the familiar riff, the drums held back for a few bars. Then Charlie, in the most understated way possible, merely started tapping out the beat - first on one drum then the next until he was playing the beat." "When I got home from that vacation I asked myself, "With all of Dave Smith's talents and skills, is there any chance he would ever start out that song in that relaxed way?" The answer was obviously "no" and so I realized that, to play simple rock, a different drummer would be necessary." "Mike Haines and I found (the late???) Phil Moore who fit the bill perfectly. I remember that he invented the word, "deet". "Let's stop at the next restaurant and get something deet." "This group made a demo and sent it around. What the record companies said caused me to make the next big change in my career." "By the time of Climax we had a lot of originals. From those days, I remember "Searchlight" (about new ugly construction going up everywhere), "St Anthony's Fire" (French people poisoned by bread), "Hourglass Mirage" (psychedelic gibberish), "Mr. Policeman" (student riots), "Parts O' Georgia" (boogie jam), "Carnal Sandra" (pun about a groupie and Colonel Sanders chicken parts - legs, thighs, etc), "Mt. Ivy" (another pun - mount/mountain), "Camille" (groupie/hurricane). Of the songs recorded by the Capital City Rockets, Climax was probably performing Ten Whole Dollars, Grab your Honey, Little Bit o' Fun, Come Back Baby, Breakfast in Bed (? ), My Orange Tie and Searchlight so any of those could have been recorded in Cleveland at the Climax session." "Glass Harp is the only Climax warm-up job I can remember and it was at a school gym. I guess Climax concentrated more on weekly gigs than concerts. After we played our closer at the Glass Harp gig, we threw handfuls of Climax bumper stickers into the crowd - causing a melee. It took Glass Harp a few songs to re-capture the audience. :) Of course, they were very good and then had no trouble."